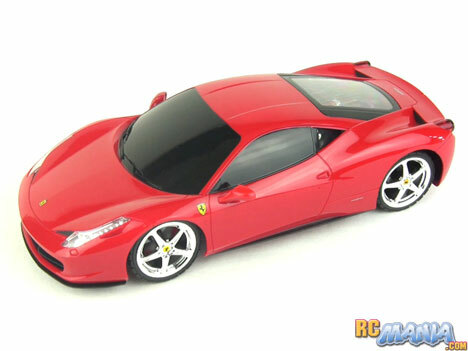 This 1/18th scale Ferrari 458 Italia from XQ looks more like a static display model than an RC. The body is an excellent replica of the real 458, down to some very fine details of creases and lines, and you can see the top of the engine through the rear window. There's no antenna sticking out of the car to ruin the clean Ferrari lines. What's especially impressive for the price is that this car includes a rechargable battery pack, charger, and even the 9V battery needed for the controller. I didn't even notice this at first, as you have to look closely at the writing on the bottom of the box to learn that all of this stuff is inside! The first time I pushed the throttle stick forward on the controller I think my eyebrows raised and I cracked an instinctive smile, because the speed of the car is good for its size and it got up to its speed quickly. RCs that take their time lingering up to speed have weak motors with tall gearing to try to make up for them. When they're like that, they slow down way too much over even slightly bumpy surfaces, and they can't be driven on slight inclines like driveways. This XQ Ferrari 458 Italia has a motor that's big enough to provide some excess power, so you don't have to be on a perfectly smooth, perfectly level surface to have fun with it. Just do note that it won't drive on most carpets -- the ground has to be hard beneath it. This is a good car and an even better deal. Simple as that. It performs well and it looks great, so it's a joy to own whether it's proudly displayed on a shelf, or being driven around at speed. As of this writing you can find it here on Amazon, and later in the year I'm told it will be showing up at some major stores.